Everybody needs role-models, someone to look up to in your industry, or perhaps someone whose work you really admire. I personally love combing through the Internet to discover tarot blogs and online journals. 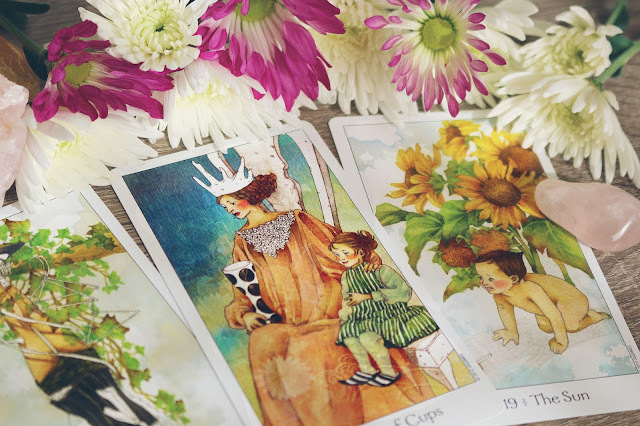 It is very inspiring for me to see what other readers are up to, and how they present their personal worlds of tarot reading. 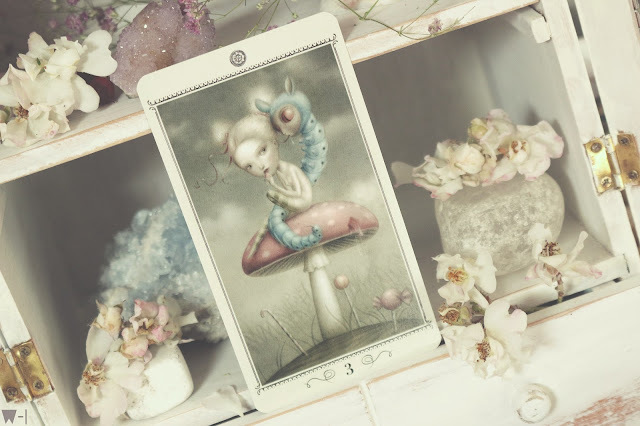 I can't remember how long ago I stumbled upon Whimsically-Intuitive, but it was love from the moment I saw the delicate and elegant photos evoking a fairy forest tale. Her evocative photos are to die for! I love it when bloggers create a fantasy world for you to retreat to through their photographs. It's almost as if stepping through a portal into a world of magic. 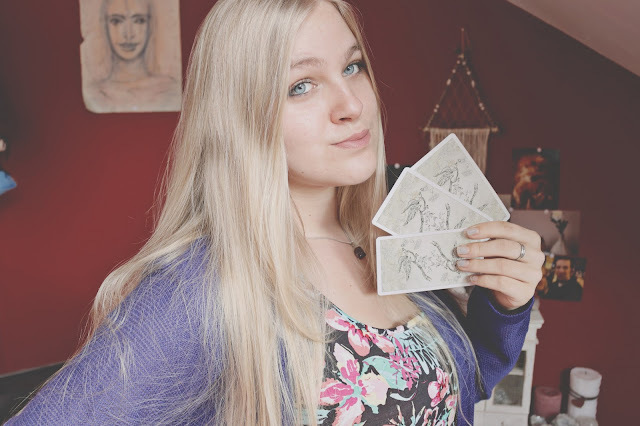 Chan from Whimsically-Intuitive is a tarot reader from the Netherlands who offers very reasonably priced readings with a theme, and with strong intent. Her tarot shop is called Whimsical Woods. 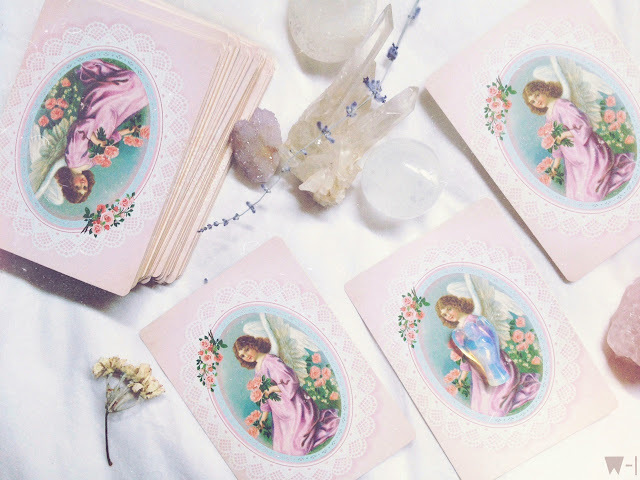 She also collects tarot and oracle decks, which gives her blog variety and allows for many people to resonate with. She is very knowledgeable about tarot titles and oracles to pair them with. Her wishlist is amazing! 01. 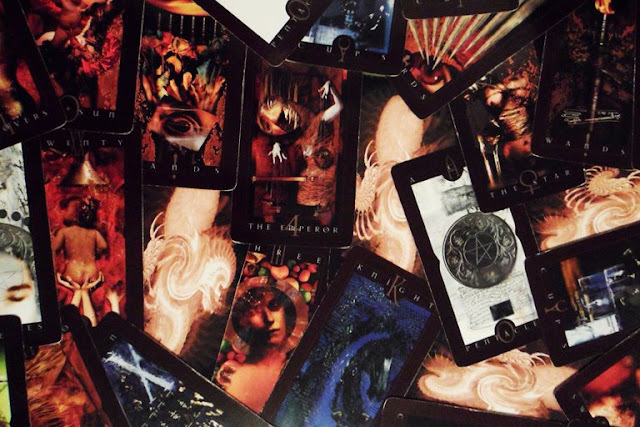 What got you started with tarot? Honestly? This story goes way back. I grew up in a very open environment. My mother was very much into spirituality and studied Wicca when I was around ten to eleven years old. Naturally a Rider-Waite Smith deck showed up at the house and as the curious little kid I was, I played around with that deck a lot. Honestly, at that time I didn't learn much from it and didn't really bother to do so either. It was just this magical little thing that me and my friends loved to play around with. It gave us a sense of wonder.. and let's not lie about it: A few good scares too! We took everything way too literal. Death card, anyone? 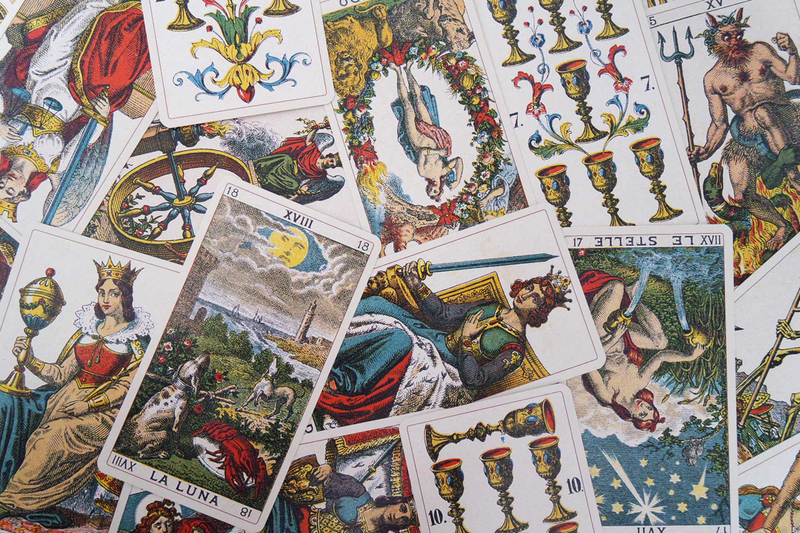 With age, I kind of lost touch with the deck and didn't touch the cards anymore but it somehow did always stay with me. It's like the draw towards Tarot never really left. It only took a really long break. 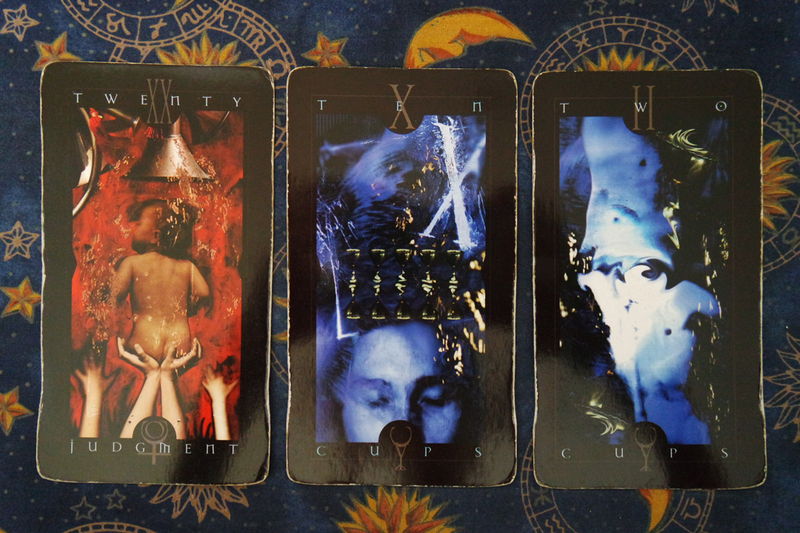 Then a few years ago, one of my friends had taken up Tarot. She did readings for me a lot. That's when I got that feeling back and slowly but surely, I went hunting the internet for my own deck. 02. 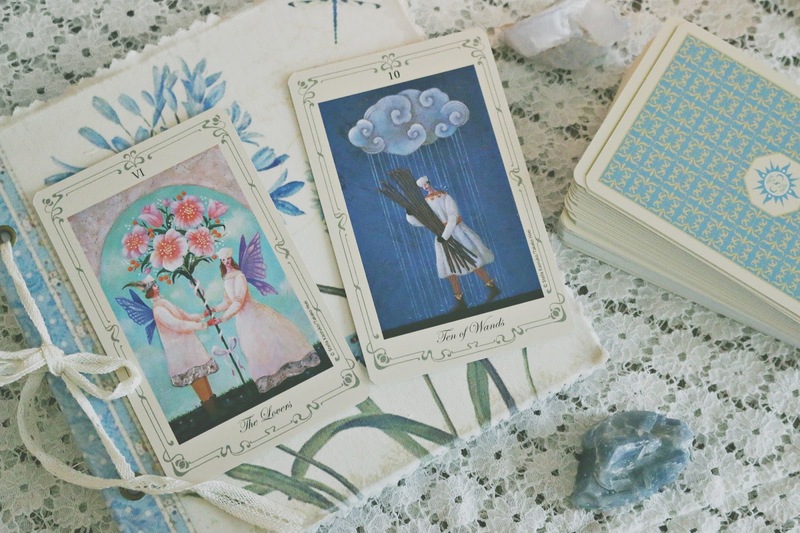 What would you advise to someone just starting out reading cards? Just keep going and keep practicing. 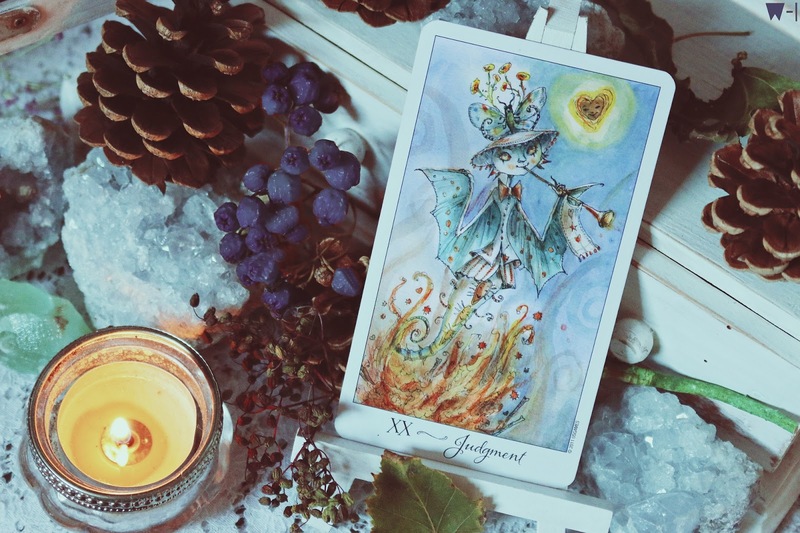 Tarot knows many ups and downs but don't let it hold you back. There will be days where you don't feel like reaching for your deck. There will be burn-outs and breaks. You can get drained and you will get it wrong sometime. It's all part of the journey, so don't let it discourage you. Don't expect to be a pro right away. 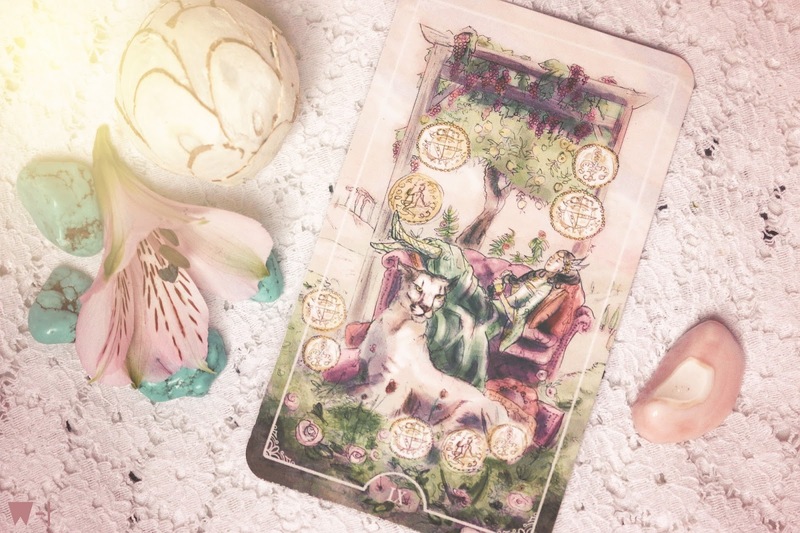 These things take time and it's important to not forget that Tarot is something you never stop studying on and learning from. Just keep on going. The rest will come in time. 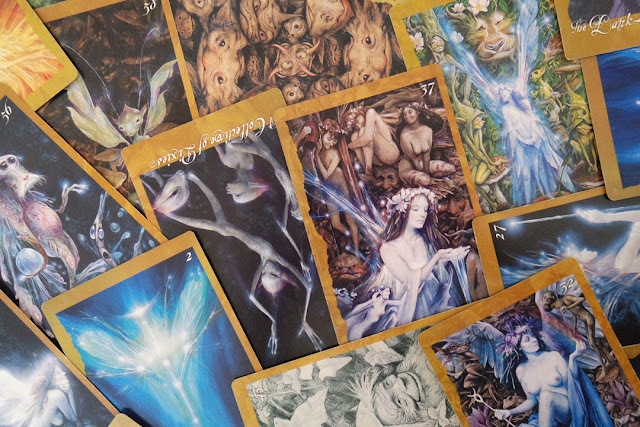 Another thing that I, personally, find important is to really go with a deck that you feel connected to. Don't just get the Rider-Waite Smith because it's traditional. If you can't connect with it or don't feel a bond at all, it can discourage you so much. Go hunt that perfect deck down! Get drawn to the images. There's so many out there. Live it up! 03. 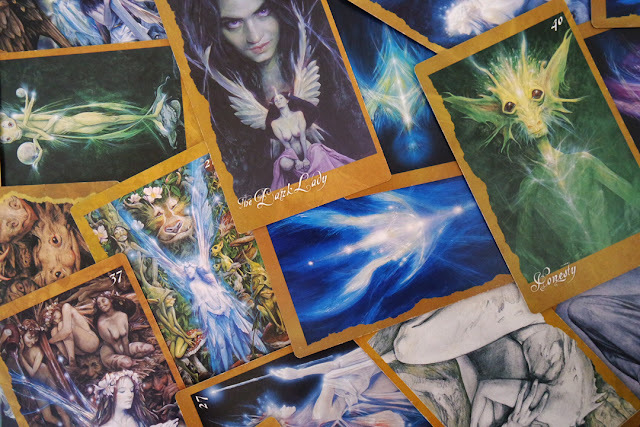 Which decks do you find yourself reaching out for the most? I have quite a lot of decks right now. 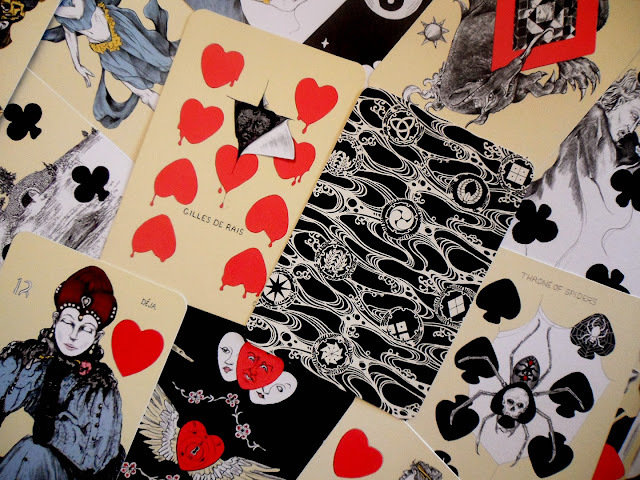 It's impossible to stick with just one but I will always have a soft spot for my Joie de Vivre deck and Paulina Tarot by Paulina Cassidy. 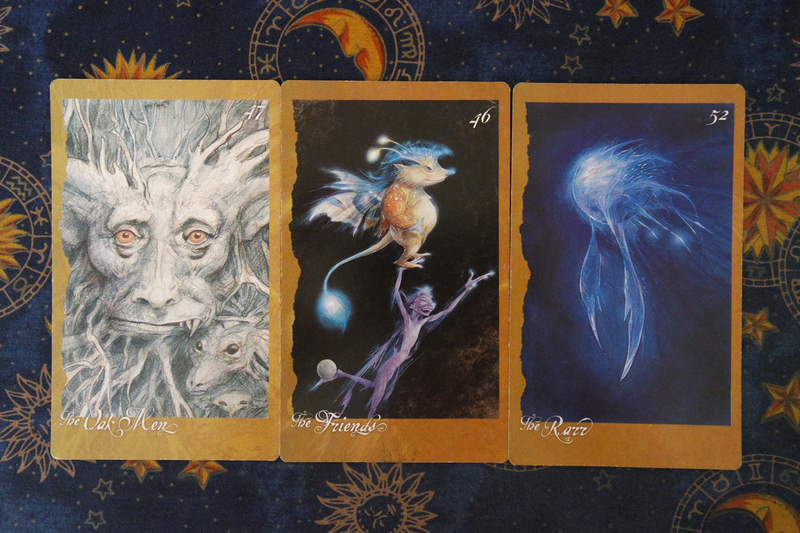 I started my journey with these two and I feel like these decks and I have this mutual understanding. I still find myself reaching for them the most because I know I can rely on them to do a great job and give me an accurate result. Plus, the artwork is something I can really enjoy. 04. 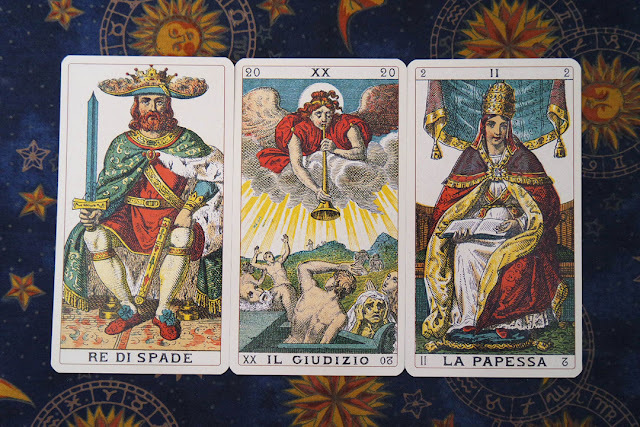 In a reading, how do you approach the cards? How do you translate what they are saying? That truly depends on what kind of reading I am doing. When I use a spread, I usually connect and tie the dots to the corresponding question for that position. At the end, you can really view the bigger picture that way and create a story. 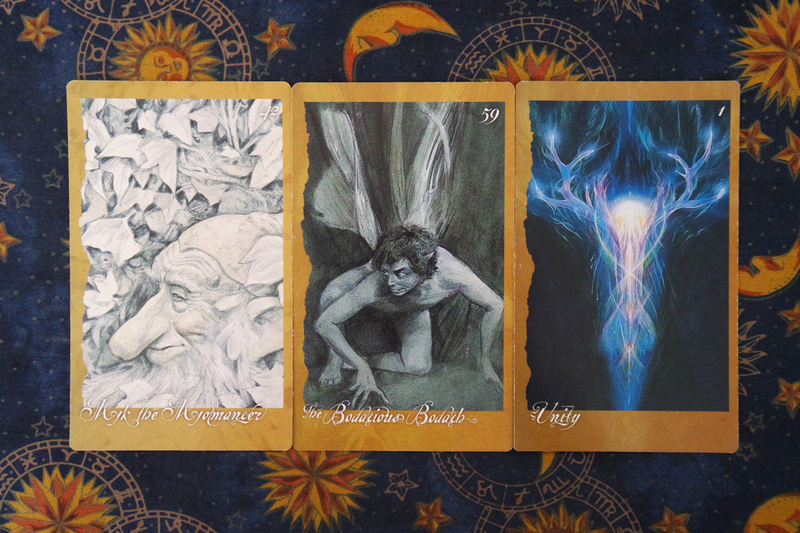 However, sometimes you just don't feel like using a spread at all and just pull the cards. When I go about that, I look at what suit comes up most, what kind of cards, what was the initial question and how do these cards combine together. It's truly a matter of sensing the vibes they give off and recognizing them. I also find it very important to have information about the issue or question at hand. When you read for yourself you already have that but when you're reading for someone else, the quality of a reading can change so much depending on the querents will to share with you and trust you. Like I said, it really depends on all kinds of factors when approaching the cards. 05. How do you get around particularly difficult cards? I don't think there really are difficult cards. I feel like it mostly depends on the time you perceive one to be difficult. Sometimes a card will pop up and you'll have no clue how it even applies to what you asked or it'll completely leave you blank. That's what makes a card difficult to me and that changes constantly. Usually when this happens, I leave it alone for awhile. Note them down or keep them on stand to refer to later. You never know when you get that aha-moment. It's also good to spend time with that particular card and try to keep your eye out to what kind of significance it has in your life that moment. Though, that is something I mostly do for daily draws should a blank happen. When it's a full-blown reading, I check the surrounding cards and take note of where the connection to the difficult one lies. Usually that does the trick and gives me clarity on how to continue. 06. What is your idea of THE ONE deck? I am tempted to say that such a thing doesn't exist! But if I had to pick something, I guess it would be more based on the looks of the deck and not so much symbolism, though it would still follow the RWS system. But nothing gets my intuition working like whimsical imagery. I guess it would be a mix of Tim Burton meets Alice meets Whimsical in an adult-twisted way. I wouldn't just want sweetness in those cards. I would want it to seem sweet but with a dark undertone where they are supposed to be or required to be. I know there are a few decks that come close to this but not quite hit the mark on what my "one" deck would be. Maybe someday I'll have the riches to get one designed! A girl can dream, right? 07. Do you practice any other forms of divination? Not yet! I do have a few Lenormand decks and I am planning on learning that system sometime in the future. Not right now though, I am still very much hung up on Tarot. I used to work a bit with the pendulum but that never really stayed with me. I think it was too much of the same to really keep grasping my attention. There are some other forms of divination that do really interest me (scrying, bibliomancy etc). Those are something I'll save for when I feel a draw to it. For now, those are just interests. 08. Do you have any advice for readers who plan to or are just now opening reading stores? One of that hardest things for me was actually opening up the store. I kept waiting for the right time and constantly told myself that that moment would come but it didn't. Truth is that when you're nervous or feel a little scared, a great timing won't be there and won't show up. Sometimes you just got to take that leap of faith, push all your insecurities aside and do the best you can do. Especially if you know, deep in your heart, that you can do it and that you are ready. To be fair though, I had great friends that really did give me that nudge forward. 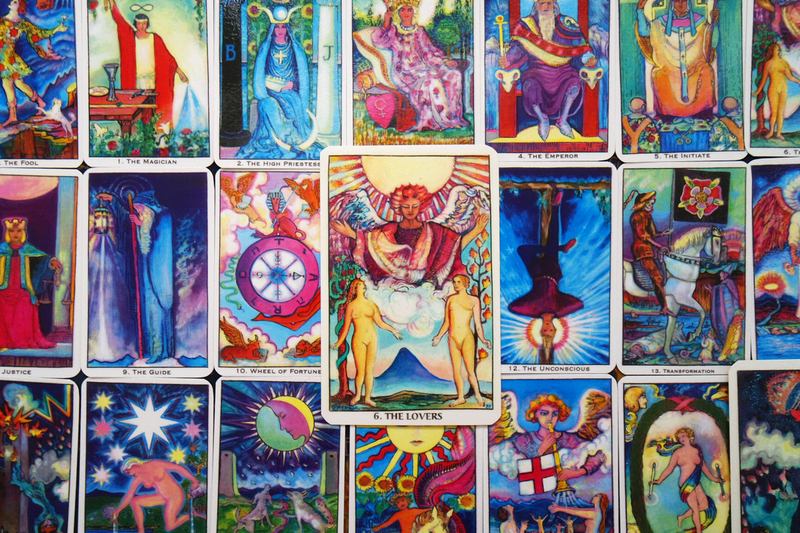 I feel that when you are in the business of Tarot and doing readings, this issue gets a little tougher too. It's not an everyday service and essentially, no one ever stops learning what's in those cards. This can make the process of taking that next big step so much harder than it has to be. So my advice would be to anyone that has been thinking about opening a store or just started out is to not doubt yourself. Do your thing and place trust upon your skills. 09. Out of the services you offer, which one do you feel most speaks about you and shows your creative voice? I don't think I offer more than most readers honestly! I offer my own spreads and also some of the more known ones. I feel I don't differ much in that from others. However, when it comes to what my readings include, I always do my best to make it a great quality with high quality photographs in a setting that fit the reading that was purchased. A sort of scenery. I take high value in not only giving the clients/querents a great reading but also one that is easy on the eyes. To me, presentation is just as important as the reading itself. 10. Shout out to your friends or sources you admire. I really want to mention Queen of Chalices and Arcane Mysteries. These two lovely people have really been a source of inspiration, aspiration and goals for me. 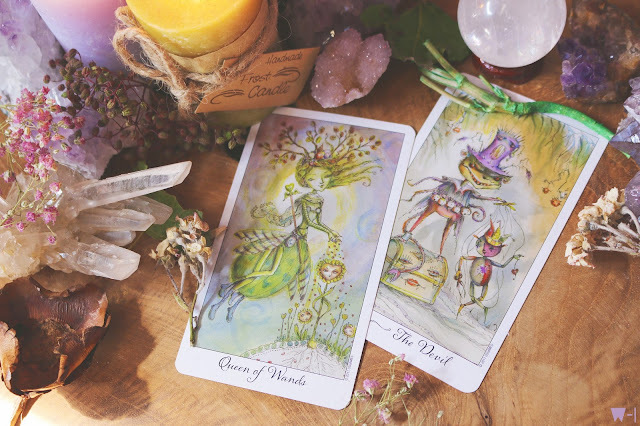 I've never shared much of my journey in Tarot outside of Tumblr and these two have always encouraged me and supported me in everything I do from the very beginning. Not to mention that they are both amazing readers as well. Queen of Chalices is very involved in the community and making sure everyone feels welcome and gets noticed. Arcane Mysteries is really a wonderful source for beginner readers and advanced readers alike. 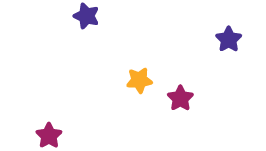 From spreads, to tips and tricks, cleansings, superstitions and whatnots. It's all there. If you are planning on joining Tumblr, are on Tumblr or just want a great new place to hop onto every once in a while — Definitely check them out. 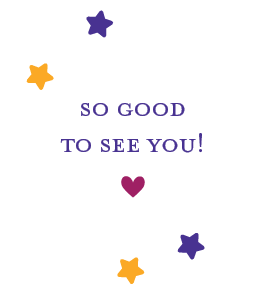 There's another person that I do also feel deserves to get known more and that is a another good friend of mine: Nightkunoichi on Tumblr. 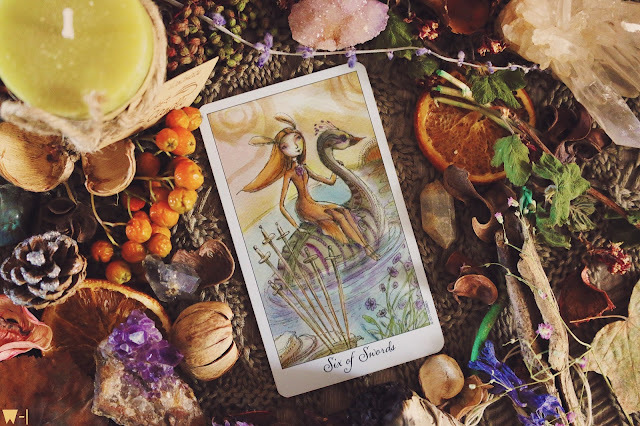 I really do admire her determination on her journey in the tarot and how much she experiments on that road. It's fun to see and it is definitely inspiring on my own path. Sometimes it's easy to forget that you may mix and match things up and try out new things. I do believe she brings this special urge up in me! So please, definitely do visit her blog. But honestly, I've build so many friendships along the way. I've found so many great blogs and people I admire that this list could go on forever. I appreciate everyone actually! Thank you Chan for taking the time to grace us with your thoughts! If you would like to book a reading with Chan, go to her shop Whimsical Woods. Please respect Chan's work. Don't use or reproduce any of these images without crediting her for it. While these images are already watermarked, it is important to respect the creative visions of artists you admire. — Leelahel on Monday, August 31, 2015 0 ♡ Comment! This past year was definitely a surprise to me. I did not expect to find myself in a new relationship. I did not expect to move, nor did I expect some of the wild changes that manifested that I had been warned about. Ever since moving to LA, I've been much more relaxed about planning ahead. Much of what I've been centering my attention around has actually been to enjoy my life. I've let go of that limited mindset that I had back when I lived someplace that was not ideal for me to be in. Now that I am out of that oppressive circumstance, I am actually so happy. This past year I played it by ear. I didn't pay as much attention to my Annual Review 2014, but it actually foresaw me moving into my new apartment on my own. That was impressive! With three Knights present in the spread, this sets the tone of the year to be a faster one in general. Things seem to be speeding up considerably, and I can attest to that. I also see two Threes, side by side. Working on the balance between personal life and work. I’ve been heavily resonating with this card lately. I see it as a big call to action and an irreversible change manifesting. Some changes can be so extreme that they shake us to our core. This is good! We don’t want to remain in the ams place forever. Sometimes all we need is a radical change to get us back in motion again. Bring that change! ★ November. Ten of Cups. Emotional solace and accompaniment from those we love most. Embrace your blessings and be glad for what you have, because it is the best that there is for you. This card fills me up with gratitude for all the love I ever receive. It means so much to me when people show their caring nature and they give me affection. This month I’m also looking to give some back! I’m seeing my Mom in November! 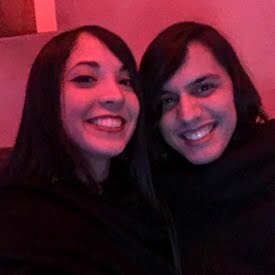 We’re taking a trip back to Tokyo together, and I couldn’t be more excited! ★ December. Two of Cups. Romantic. Two souls coming together, seeing one another reflected in the other. Bonding sometimes escapes human senses of perception and enlists those that we have but may not be fully aware about. It’s wonderful to have somebody to share the deepest aspects of your soul with, that understands you and loves you no matter what the two of you go through. True love! After so much excitement, the start of year feels like a lull. I interpret this as trying to hang onto the past that is no longer there, only to feel it a little longer. We can’t always deny the future that is promised to us for our own personal needs. There are bigger things in the picture than we can see that are not always up to our control, but the best we can do is to trust. ★ February. Knight of Coins. Settle down into this new year and new life gracefully. Seek out things for your space that make you feel cozy and at home. Look for the little details that brighten up your life and give you a sense of safety. Embrace all that you have, say thanks and carry on with all your plans. ★ March. Four of Wands. This month is echoing the sentiment of the previous one, with making things feel more at home. Look to clean up and purify your space. Decorate it in a way that feels lavish and will make you want to have people over to accompany you. Taking a trip to another land can break away the sameness from being nesting for two months. Seek out the answers you wish to find and your own independence by moving forward at increasing speeds. Keep all your elements in harmony and under control, and you will find you’re not missing anything as you go. ★ May. Seven of Coins. Are you going? Are you staying? You have options to consider. Take your time in pondering everything that is just out of your reach but will one day manifest itself as a need for you to take action. When you see things coming, you are much more prepared to tackle them. ★ June. Three of Cups. Rejoice! Things are coming together. Embrace the friends that support you in your journey and look to enjoy special moments with them. Seek to make your life pleasant and simple, and delegate those things that no longer make you happy. You don’t need them. ★ July. Three of Coins. After the celebration comes the time to get back to work. Bring out the materials that have been in slumber for way too long and seek out ways to make your process less tedious. The goal is to knock a few things off your to-do list. Work, dammit! 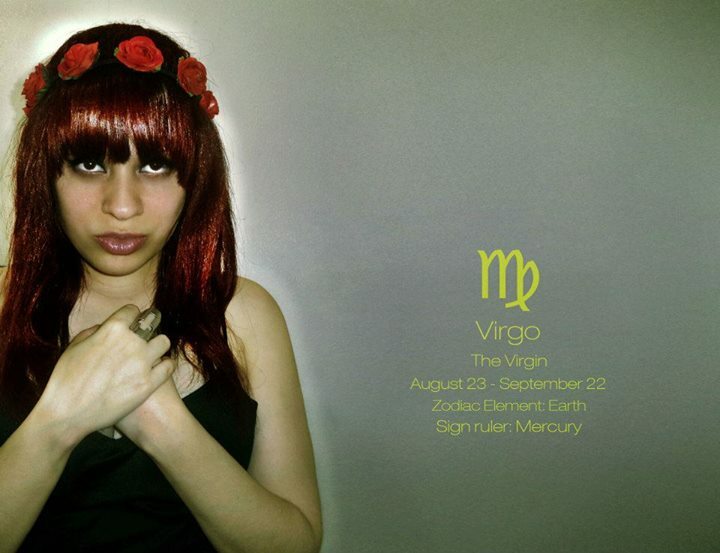 ★ August. 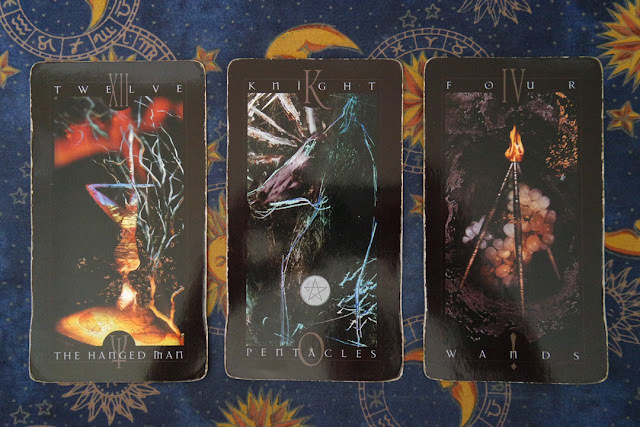 Page of Wands. Enthusiasm, passion and creativity unlocked from the depths of within. Look for the things that keep you inspired and that spark your enthusiasm for life. If you’ve had too much of the same lately, break away from the routine and try something new. Chances are that was all that you needed! ★ September. Knight of Cups. An intense proposal comes your way, knocking you out of the water with surprise. Embrace the love you are given and give it back with the same amounts of intensity. Learn to show through actions and through how you live your life just how much you are capable of sharing your love. Oh my! This card is giving the year a naughty spin with so much romance being present. To me this is also a sign I will be working on limitations from the past that haven’t allowed me to move forward in whatever area of my life they are present. It’s a sure sign to break the chains and fight for my freedom from oppression. I’m not a big fan of being stuck for long. Would you like one of these readings custom made for you? Visit my Etsy shop! — Leelahel on Friday, August 28, 2015 0 ♡ Comment! ♡ August. 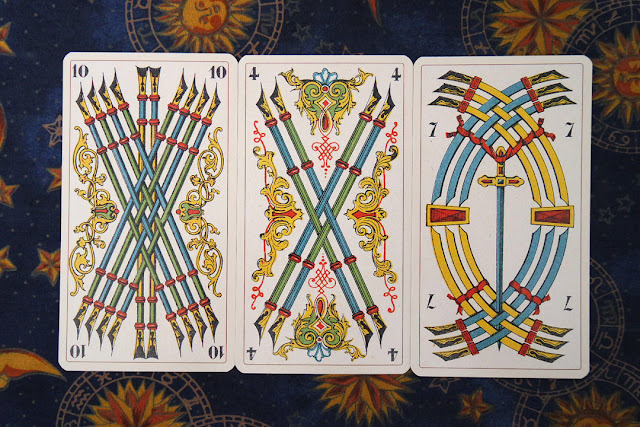 Page of Swords. Clarity in how you express yourself. Never think twice in standing up for yourself to others, particularly if they fail to understand where you’re coming from. There are times when you actually don’t need to say much, because the way that you feel becomes so clearly manifested that words are unnecessary. ♡ September. Knight of Cups. Falling in love with life means running with it and feeling all there is to feel about it. Seek to nurture yourself and your soul with all of those things that you dream of. Embrace the good things that come to you as gifts and graces from divinity. You’ve earned it. ♡ October. Eight of Coins. Shifting gears once more into what comes out to be a busy month. Invest yourself in projects you’ve had halfway there that have not yet come to their conclusion. Pause to look everything over and go back into it with the intention of polishing it to perfection. Work out those things you’ve been telling yourself you need to get to in what feels like forever. ♡ November. Ten of Cups. A great time to enjoy and to be thankful for all those things that have gotten you to this point. I feel like this echoes a lot of the feeling from September, in which you may be feeling grateful for the blessings in your life and how they adorn your life with moments of love and joy. It’s important to nurture family, close and far during this month. Reach out and let your loved ones know you care. ♡ December. King of Coins. This month is definitely not one with fast activity; it seems more like a month to pause and collect your bearings. It’s evoking a feeling of being on top of your stuff and feeling the security of providing for yourself. A great way to wind down the year is with cozy stability. ♡ January. Nine of Cups. Embracing the company of others in good times. I read this as satisfaction with you goals, and likely a wish coming true. ♡ February. Ace of Cups. To complete the month before, a new love is coming into your life that will really lift your spirits and nurture you. Embrace it, accept it and take it into you as a manifestation of your own self. Learn to love and to be loved with nothing but the most caring feeling. ♡ March. Two of Wands. This reads as a month of inactivity, perhaps because of the inability to make a decision. This or that? Yes or no? Today or tomorrow? Take a pause, think it over and pick one then the time is right. ♡ April. Ace of Wands. You did pick something. Apparently the right decision, because it looks like you will be hyper motivated to take this new project on. I feel a huge surge of energy and passion. Turn it into motivation to do your things. Uh oh, where did your motivation go? I read this as a full stop to the momentum you had finally worked up for yourself. Pause for a moment to consider how you can improve upon your situation. ♡ June. Eight of Swords. Things remain frozen. You need to take control over your circumstances again in order to put the stalling to an end. Given the month before and the month coming after, it seems you have some difficulties yet to face. ♡ July. 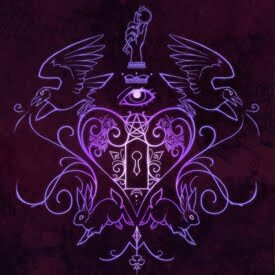 Three of Swords. You can’t resist change. Sometimes you have to accept it with grace in knowing that eventually you’ll get over whatever it is that you’re currently going through. Have strength in trying times! ♡ Signifier. 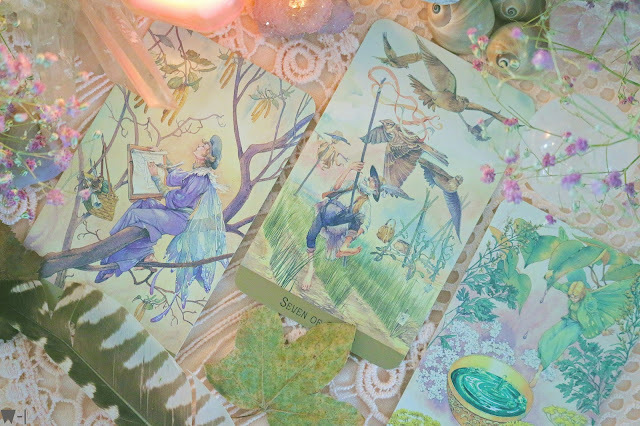 Six of Wands. Go forth with your plans and with your strength. Don’t take no for an answer, and make sure that you remain with the same positive attitude that is necessary. — Leelahel on Sunday, August 23, 2015 0 ♡ Comment! Everything about this deck is absolutely stunning. I love the matte card stock, how thin it is and also how easy to shuffle and fan out. I have zero problems fanning Lo Scarabeo card stock out in uniform. I’ve seen many incarnations from this deck before. My favorite was the one published by Il Menenghello as the Soprafino deck, but when I found this print run, that all changed. 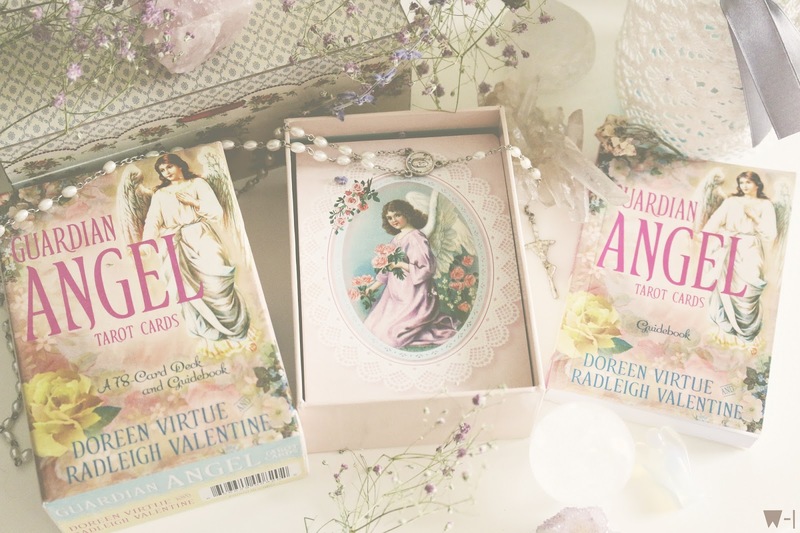 I loved everything from the colors, to the card stock, to the lovely card backs that it has. I could spend time just shuffling the deck and enjoying the crunchy feeling of the card stock. No reading required! 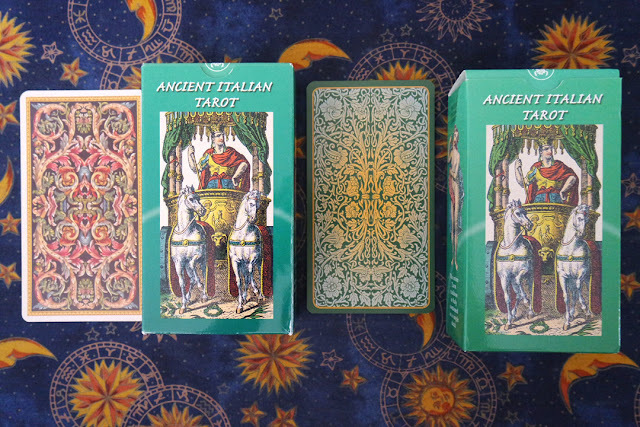 Since it is an non-scenic Minor Arcana deck, I am looking forward to testing my intuition in how long it takes me to adapt to a new system of tradition. It can of course be tied back to Rider-Waite Smith tradition, but I am of the belief that each deck had something to share on its own. We don’t need to limit it simply to the system we read with because that’s what we’re comfortable with. That’s the point of having variety! Listen to the story as it comes. 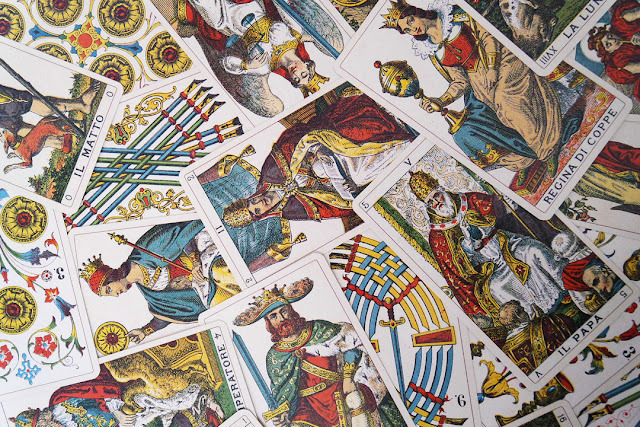 There is no need to box a tarot tradition into another just for the sake of comfort. Who doesn’t like an enriching challenge? At some point the backs were green and white. Then the ones from the right were published, and finally the one on the left is the one you would be getting now if you were to purchase this deck. 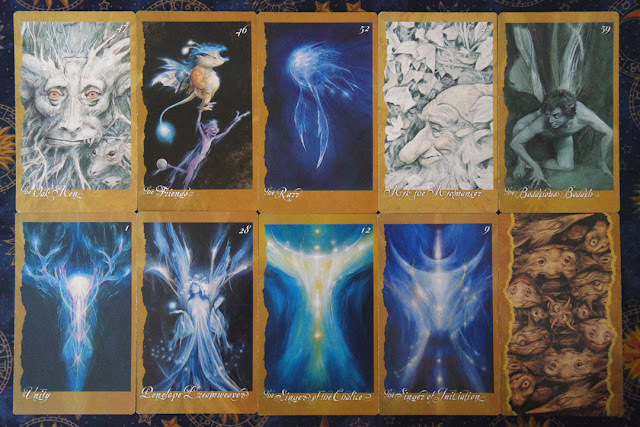 This is definitely a deck I would like to spend more time with, and would love to end up using on client readings in the future. I’ve even got a pouch set aside to use it with. The colors in this deck are supposed to be somewhat muted, but I find them extremely appealing with the weathered look that accompanies. The woodcut illustration style is also a major plus about it. 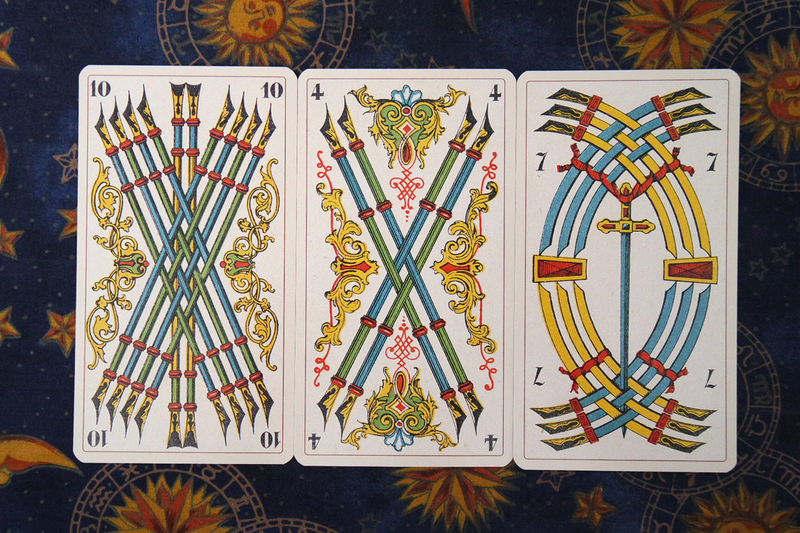 To be honest, I can’t find anything about this deck that I don’t like… and that’s why I love it so much! There is something really special about this deck, and I attribute some of its worth to the history there is to it. I also really resonate with the engraving illustrations. For me, these cards look like a tarot deck should. I especially love these new rainbow colored backs. They pull it all together for me. I’ve piled on the years, each one outweighing the other and forming what has come to be the foundation for all that is out there now. Big things are built with patience, inspired upon the civilizations that built our race to be what it is now. I offer a standing legacy of hundreds of years. I’ve got a steady, unshakable foundation that is locked in and ready for whatever shock comes its way. There is no shaking something that was built to last, as you will soon come to learn. There are some things you can’t escape, and that’s reality. Try not to close yourself off to what is actually out there and surrounding you in circumstance. Outside influence can have as much to do with what you are dealing with as things on the inside. Be aware, and come to face what you need to. Strength comes from steeling the mind. When you face things head on but remain in silence, you allow enough space for intentions to manifest themselves and make themselves present to you. Be ready to take it head on and strong, and also remember not to show any signs of intimidation. You are here to handle what you are given, not to shy away from it. You need to accept the bond that is offered. Take in the harmonizing feelings of promise and connection. There is divine sacredness in two things coming together to form one. Take your work tools and love them to the point they become part of you. You will be inseparable! 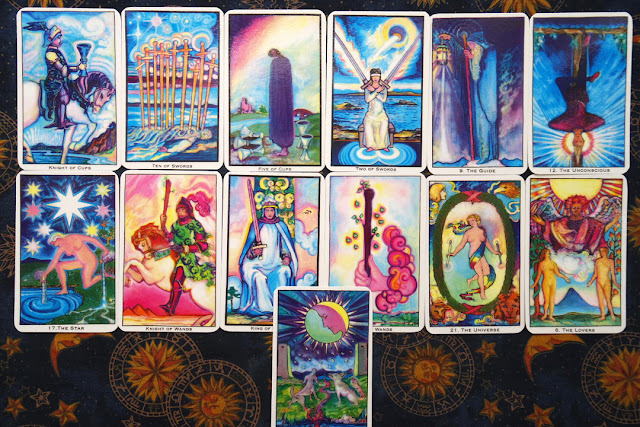 Using this deck, you will establish a safe foundation. It will be like coming home after a long day of work to discover you left it in the perfect shape for you to feel most comfortable and cozy. There is no need for further adornment, you can expect things to remain in order. Although I have been very strong in my answers, I present nothing but compassion and understanding of the deepest mysteries of life. It’s important to understand why we attach to certain sentiments in order to prevent harmful cycles from turning into a continuous problem. It’s good to cut problems from the start so that they don’t give you grief. You call people back into a conscious state, so that they make take control in their lives. Take pride in being a source of inspiration and a messenger of light. It’s important to accept when your life purpose is to lead people out of the trenches and into the expression of the best forms they can be. The quiet companion, the one who sees. I have the advantage of being an exponent of history without directly being tied to a particular time. Since I am relevant still today, I am a time traveller bringing olden concepts in to serve you in your current life. Regardless of how I look, I am relevant and I am powerful. This deck has such a regal personality to it. I rather love it! I hope to be able to consult it for deep and insightful readings! — Leelahel on Friday, August 21, 2015 2 ♡ Comment! I never though I’d see the day I shared the story of my very first deck meant to be used for divination. It has weaved in and out of my life ever since I got it. I was eleven to twelve years old. It all started one day when I got to my art classroom and found my desk buddy Claudia already there. She had the most amazing day planners and handwriting. Claudia inspired me endlessly, even though she doesn’t know the impact her influence had in my life. When I put my bag down, I noticed plaid backs on cards. I knew what they were automatically, even though I had never seen them in person before. They were the standard Rider-Waite Smith pack. 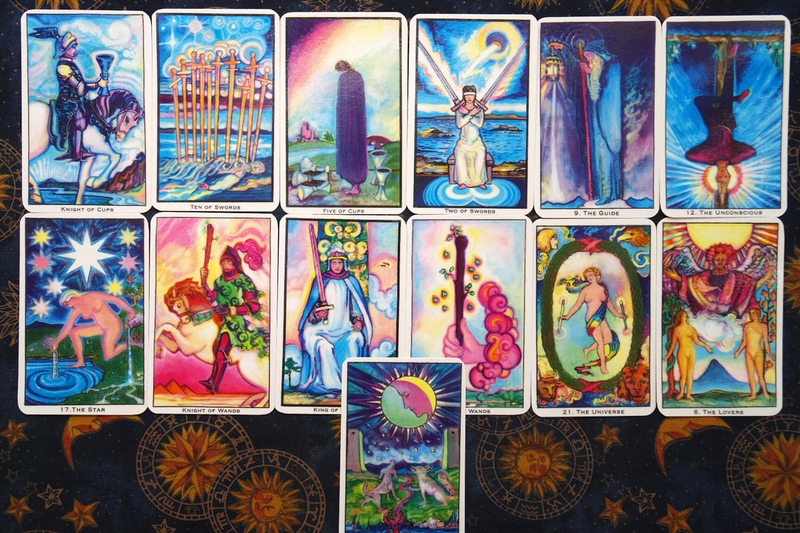 Instead of asking her for a reading, I asked her if I could look through them and she obliged. I had never felt that way before. Later that day, it so happened my Mom was picking me up from school. I asked her if we could go pick up a set of tarot cards and she said yes. When Dad got home, I was already dressed. We were going out to dinner, but were going to stop by Borders before then. I raced over to the metaphysics aisle and ogled at their selection. After going through their sample cards, I didn’t find anything I clicked with. Thoth, Rider-Waite Smith, Marseille… they were all there! This was not at a time Doreen Virtue was as popular as she is now. A pre-Doreen Virtue selection looked nothing like it does now! 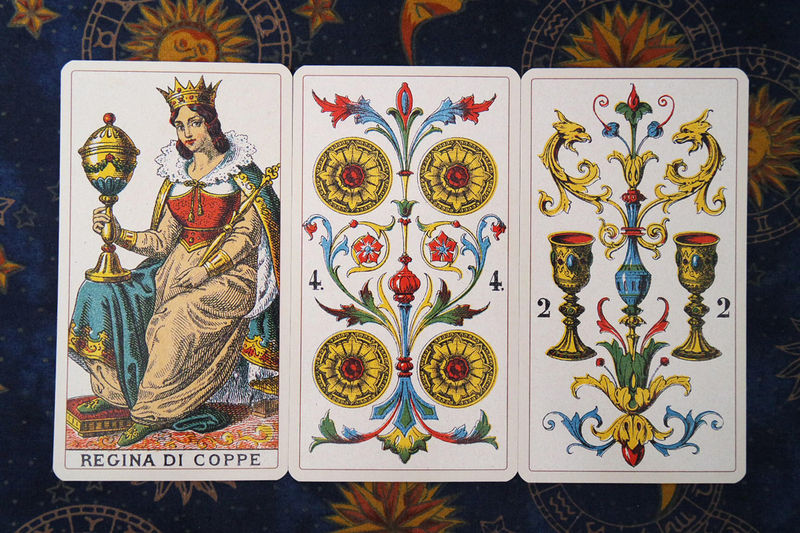 I looked though the Gothic Tarot of Vampires, the Faeries’ Oracle, the Rider-Waite Smith, and the Vampire Tarot. 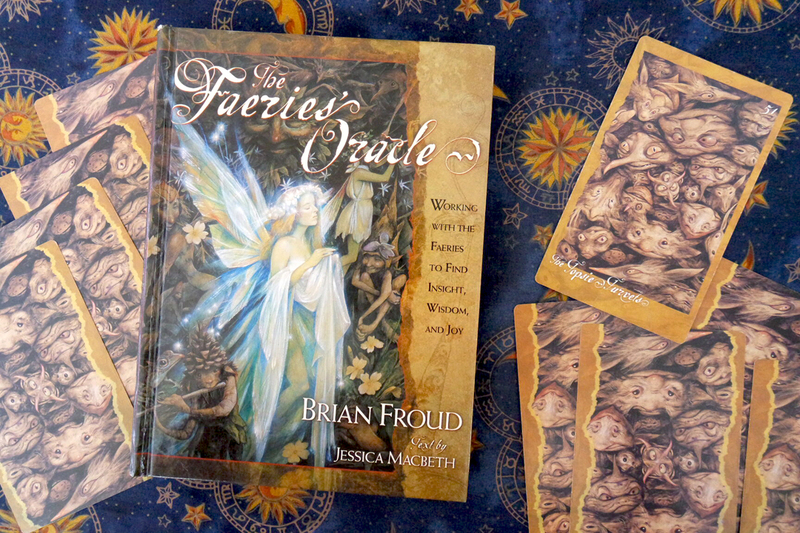 I ended up getting the Faeries’ Oracle by recommendation of the lady working at Borders. At dinner, I couldn’t contain my excitement to go home and tear through the shrink-wrap. That was the first time in my life I ever felt the electric excitement of holding a new deck for the first time. It changed my life forever! I must have spent all night looking through the cards and reading through the excellent guidebook. I remember thinking that they went a bit overboard with the drama and the magic, but I went along with it and enjoyed finding magic. I even started my very first card journal! It is around this time I first made an account at Aeclectic, but it was deleted through inactivity. This is where my journey started. I took the deck with me everywhere I went. I remember steadily working my way through this book. Nothing read intuitively for me. I’d lay the cards out, stare into them and blank out. That’s how dependence over the companion book started. The titles and the illustrations seemed unrelated to me. The illustrations were trying to tell me something else. I couldn’t begin to imagine where these titles came from. They felt forced on. They still are. Some of them are hard for me to read. Still, I insisted. I tried giving schoolgirls readings, and noticed it brought people together. I spent afternoon after class with groups of girls gathered around me, giggling endlessly. 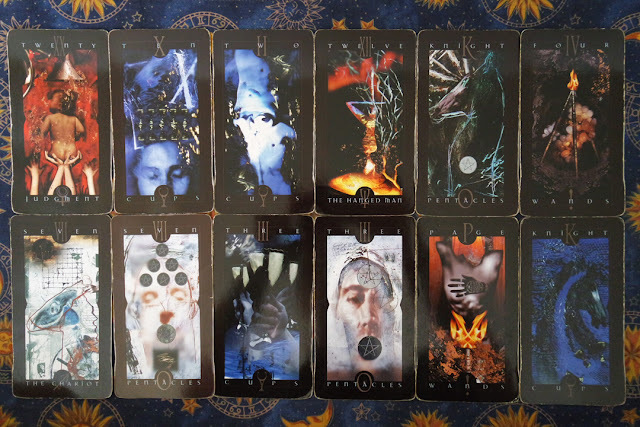 Even though I had no idea what I was doing, I kept going with it and I learned to read traditional tarot with Voyager Tarot and Vertigo Tarot. Today, I took out the deck that started it all. It is more robust than its sequel, and I’m giving it a chance to tell me all that all that it couldn’t say when we first started on our journey. I am pulling off the veil, greeting my oldest friend and looking at it through fresh eyes. The card stock is highly durable. I slid this deck through school hallways and countless cities across the world. It has seen its fair share of use, and yet the card edges are still sharp and like new. The book barely shows wear. The box paper has yellowed on the inside. Durable a good 10+ years later! The one photographed is actually a second copy. My original copy is back home. I felt the need to use with it and connect to it, so I ordered a used one online. I want to dance among the faeries, to sing with them. Old wisdom does not nee does not need to make itself flashy to appeal to anybody. It is as it is, and there is no changing that. Make friends with the olden ones if you like, but if you don’t we are around and constantly engaging your world anyway. I give you a little push when you need it, or light the way when you lose your path. Sometimes you just want support, regardless of where it comes from. I am here to offer that support and to encourage you to try for new heights. Keep on going! This card always stumps me, from the very first time I got it. Are you hopping around from card to card, situation to situation, problem to problem? Slow down. Things will get better! Just take a moment to step back and harness the potential of your opportunities. Patience takes time. Just about anything you wish to learn or achieve takes time. You will have to get used to slow paces, and working things the way they did ages ago: with effort and in time. You can’t rush through life and hope to gain the same amount of experience. Learn to be comfortable with yourself and your abilities. Close yourself off to doubt and prepare to take leaps towards what you want to do. The answers you get aren’t always those that you want, but often times they are the ones you need to hear. All will come together for you, naturally and in its own course. You don’t need to force anything because you are already tapped into a divine source. Enjoy the polarities and how they come together to compliment one another. Embrace yourself in all of your layers, and more of the same will come to you. I am the bringer of light, the one that harnesses the power of the other world as it comes to interact with yours. I am a tool for the deepest intuition, to help you see parts of yourself that are dormant and also wish to shine. Listen, listen to your intuition and find magic therein! 12. 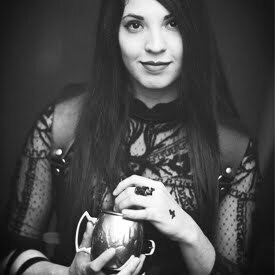 The Singer of the Chalice. I see you as an agent of love and compassion, projecting out that love even when it is not reciprocal. You do not need to be stingy with the care that you offer; manifest it forward and let it expand on its own. You will be glad that you did. 09. The Singer of Initiation. I am the bringer of ideas. I will channel new concepts through divine sources to pass onto you, my student. Learn with an open heart, an open mind and an open soul. All those messages that you seek will come to you and flow through your voice, as if in song. Sing. A lovely interview. A pretty powerful one, too! — Leelahel on Friday, August 14, 2015 0 ♡ Comment! I’ve made the announcement just about everywhere else except here. I’ve decided to take my services a little further than just offering them here, so I’ve opened up my very own Etsy shop! There are so many services I have queued to offer to you, but while we get started, I’m offering the core services for now. For 14 years now I have been a dedicated cartomancer; also learning divination practices such as tarot, playing cards, lenormand, geomancy, tea and coffee readings, and numerology based off what your life path is and what you’re working on in the current year. 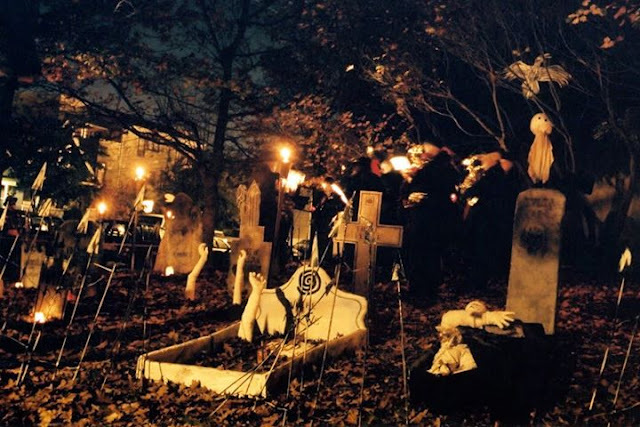 I practice working with spirit and offer spirit readings, at times also hosting séances amongst my friends for messages from beyond of any kind. 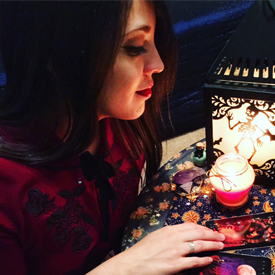 I’ve been offering paid readings since 2010, and also blogging here since then. In 2011 I started offering paid readings through Skype on the blog. Those will remain available to my clients. I plan on updating that section very soon, though. Now I’ve finally taken a step towards expanding my career and practice, and I hope you will all join and support me in this process. 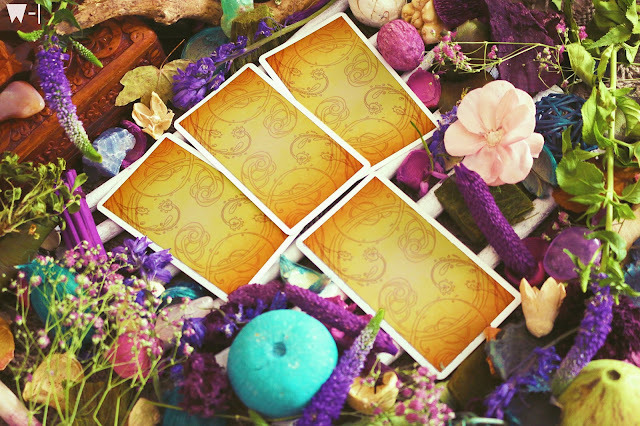 Anyhow, to commemorate the start of my new journey, I’m offering a 50% discount on the premium readings to give you all a chance to sample them if you so wish. 50OFF is the code. It’s valid until mid August on all readings over $50. I hope to see you there. Please share this post with your friends if you wouldn’t mind. This reading is going to be to the point. No outside influences, just what you ask me for. Like a bullet! 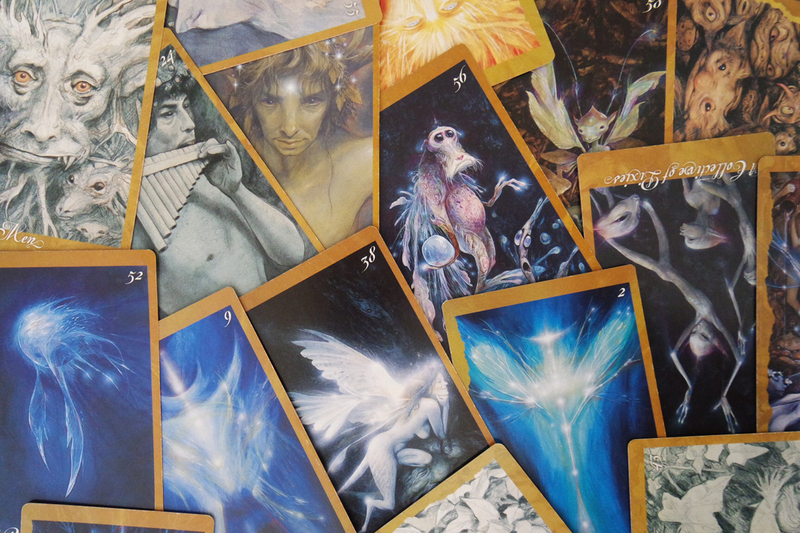 I will be pulling one complimentary oracle card or playing card to give you additional answer on the question. To tie it all in for you! 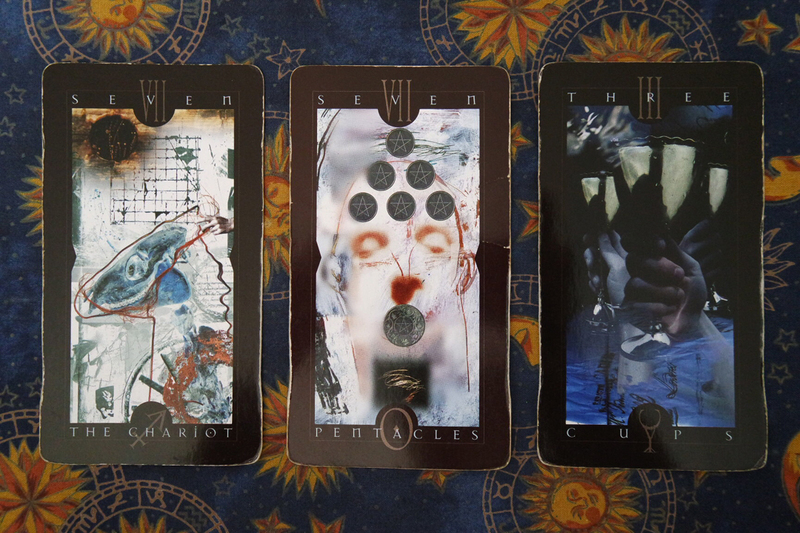 What I like about this reading is that it can be tailored to you and your needs. If you need to know the influences of the situation and where things are likely to go for you, this is a great reading. Ask me one question about your life, detailing what it is specifically that you want to know. Focus the question on your need, and in one aspect of your life. Let the cards do the rest, and wait for my thorough interpretation! Please include your first name. If you are asking about somebody else, include their first name also. This reading will include from 13 to 21 cards, or maybe more. It is DETAILED! 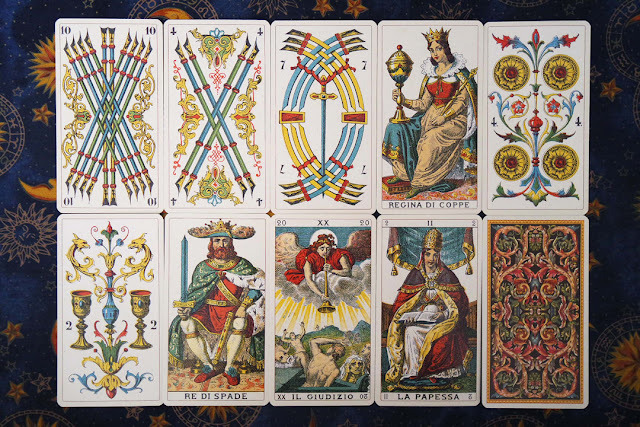 This reading will include from 13 to 21 cards, or maybe more. It is DETAILED, and the same as the Tarot Reading by Leelahel listing. The only difference is that I will conduct your reading live on camera and post it on my channel. You will be able to watch this video and pick up all the nuances in my voice as many times as you like! 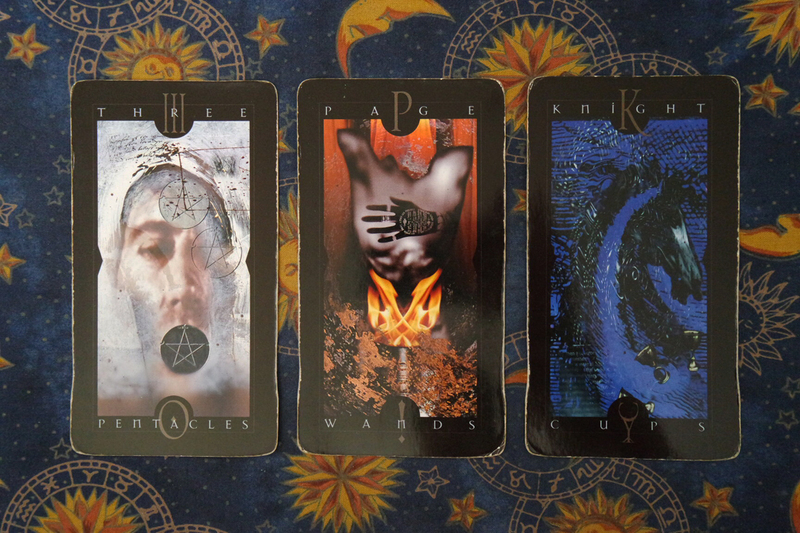 For this reading, all you need to do is send me your first name in. Ask me one question about your life, detailing what it is specifically that you want to know. Focus the question on your need, and in one aspect of your life. Let the cards do the rest, and wait for my thorough interpretation! Playing cards have always fascinated me as a child. I have been taking Ana Cortez's certification course, and since then I have found this method incredibly to the point. What you get is a week by week projection up to a month and a full analysis as to where you are in terms of mind, body and spirit. It works best with a specific question geared towards your subject of interest. 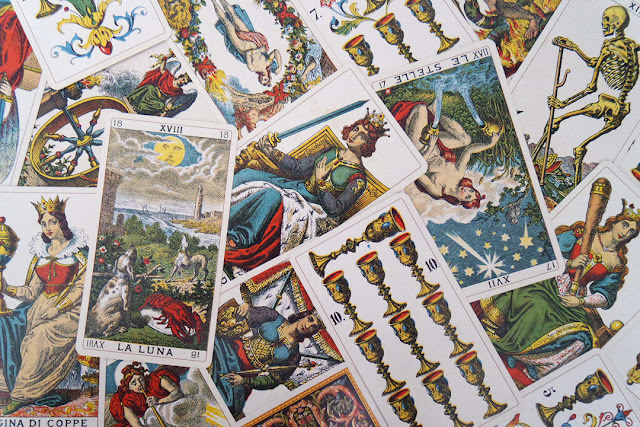 Using playing cards and geomancy, I will compose a personal reading based off your needs. You will be receiving a PDF detailing everything. This is a 4 cards reading. It will include three geomantic figures drawn and interpreted as well. The relation of the geomancy to your life will leave you in awe! I thoroughly enjoy and recommend this method of divination. My clients always love it! Unlock the secrets of the once living. Is your idol dead? 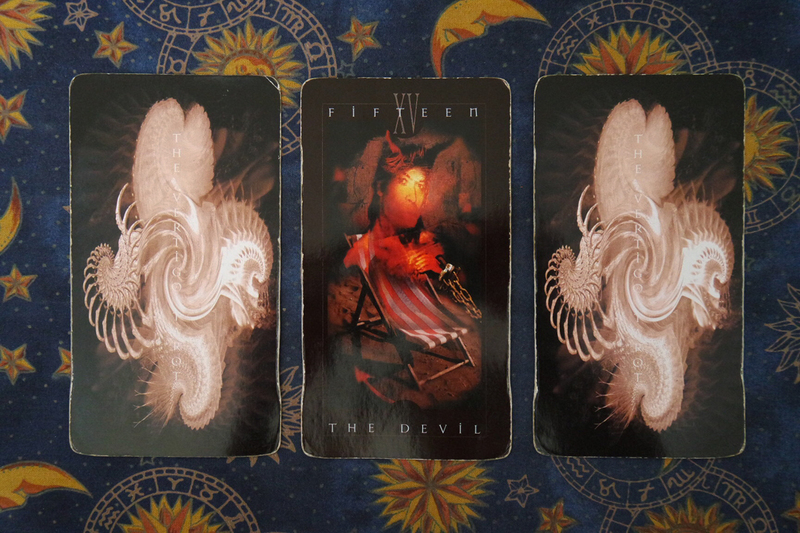 Let’s channel some advice from them to you, using alternate methods of divination. Must be an actual person that lived and died. No fictional characters. This reading will be without cards. 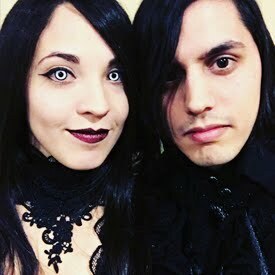 I need the name of your idol, your favorite photo of them as well as what you would like to ask them or know about them. Please be specific, as I'm likely to get better results if my interaction with them has a sense of direction. Fun fact: This reading started with Bela Lugosi and Walt Disney. Intuitive messages from spirit, no tarot cards used. Works best if geared towards a specific person in your life that passed away, or can also be a spirit guide. No fictional characters. Has someone passed away and left you with the feeling that they still had something to say? Do you miss someone that has passed into another life? If you would like to hear about somebody no longer with us? I recommend asking for this type of reading. 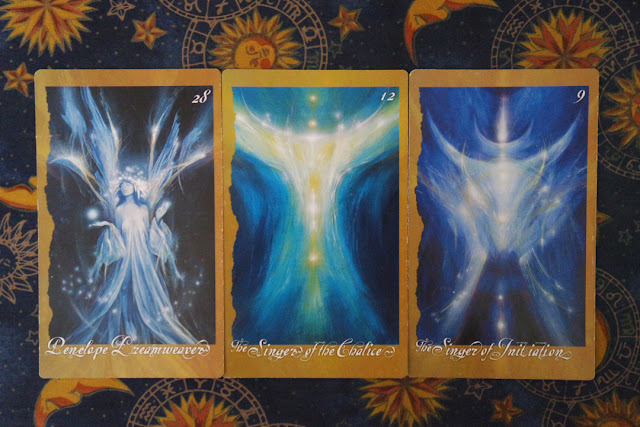 These types of readings have had excellent results with my clients, as well as in my personal ventures. It is a lot like channeling messages. It’s a good way to figure out the answer to any questions you have pending. 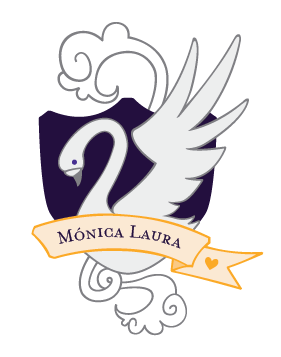 For this reading, please provide me with the name of the person you want to get in contact with. You may provide as much or as little as you want. Photos help me immensely to connect. Get 50% off on readings over $50 with the code 50OFF until mid August. Don’t miss it! 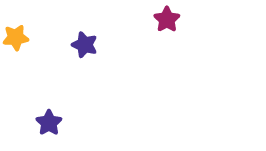 This listing is a $1.11 cost for an entry into a monthly raffle, starting in August and produced in September. So on every month. If only one person participates each month, that person will be an automatic winner for the raffle. Raffle winners will have their questions answered in my Youtube channel. You can request any reading from my shop, so long as it is not a spirit reading. Advice from Your Idols and Messages from Beyond will not apply. Ask me anything that you want! If more than one person participates in the raffle, I will do a name drawing at the end of the month to declare the winner. I may also include the name drawing in the video to ensure that the results are fair every time. This is just now starting, so please feel free to engage me with your ideas. I hope to be able to read for you soon! — Leelahel on Monday, August 10, 2015 0 ♡ Comment!